Once the bull run has ended, fighting cows are set loose in the bullring, a very popular event with mass attendance in Pamplona. The fighting cows are much smaller than the bulls and are released one by one into the ring, running around and charging against anyone getting in their way. The more daring men jump into the ring to measure their strength by making passes in front of the cows. No fatal injuries have ever been recorded although there have been minor injuries. The cows' horns are padded to ensure no real damage is caused, although knocks and bruises do happen. In general four cows are released although this number can be increased, depending on the decision of the head of the Municipal Police or representative attending the event. Unlike the bullfight in the afternoon, the cows are not killed, simply withdrawn to the pens. The young people dodge the cows, in any way they can, demonstrating their fearlessness to the public. It is an entertaining event, marked by spontaneity, a blend of expertise and courage shown by the people in the bullring as they dodge the charging cows. Professional fighters never participate in this act, the protagonists are ordinary people in a bodily encounter with the animal. Fighting cows or Vaquillas have always been exceedingly popular. Formerly this event was known as Novilladas as under four year old bulls were used. 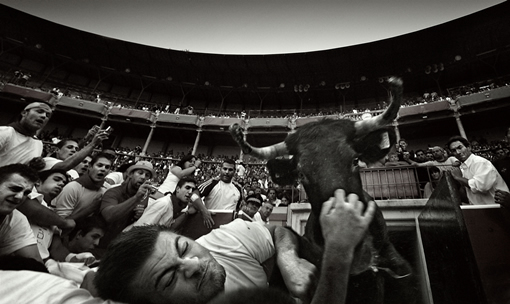 At that time the young bulls were released in the Plaza del Castillo square, in the very centre of Pamplona. This fiesta has gradually been regulated over the years, although it was initially a complete improvisation in which the lack of regulations, on occasions, led to violent behaviour. For this very reason, every year the mayor of Pamplona issues an edict which literally prohibits "holding onto, harassing or mistreating the beasts and any act which would make it difficult for the animals to leave or enter their pens". The very Aficionados who come to the bullring each day, are the ones to shout at anyone behaving irresponsibly and bothering the animals whilst not complying with the regulations. Written in the history of the San Fermin fiestas is the injury suffered by the North American writer, Ernest Hemingway, on 8th July 1924 when he tried to hold a cow by its horns and was thrown to the floor.